"Once in a Blue Moon" — we've heard the phrase and know its colloquial meaning implies something improbable, something rare, absurdly rare even — an event with the probability of occurrence falling at slim to none, as likely as pigs taking wing or hell freezing over. Yet a Blue Moon is more than just some improbable event. Officially — and yes there is an official Farmer's Almanac definition — a Blue Moon is the third Full Moon in a season that has four. Usually there are only three Full Moons in every season, one each month. Every couple of years, however, we get a bonus Full Moon due to the roughly 11-day difference between the natural, lunar month (28 days) and the calendar month. But why is it the third full moon and not the last one designated as Blue? The answer is complicated and due to the Christian ecclesiastical calendar which is, surprisingly, lunar. The dates for Easter and other Christian holy days, those moveable feast observances, are calculated in reference to the Moon rather than a set calendar date. And a year with an extra, 13th moon skewed the calendar, and so the solution was to call it "Blue" and not count it in order to keep the calendar on track. 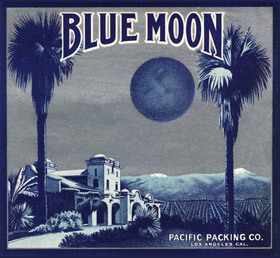 In researching the meaning of a Blue Moon — when I first decided to call my astrology business by this name — I discovered, in an article published by Sky & Telescope magazine, that the most commonly held definition of a Blue Moon — two full moons in the same calendar month — is actually based on a misreading of a 1937 issue of the Maine Farmer's Almanac. In his 1946 article, "Once in a Blue Moon," for Sky & Telescope magazine, amateur astronomer James Hugh Pruett cited some of the comments from Laurence J. Lafleur's 1937 almanac article, but added the following: "Seven times in 19 years there were — and still are — 13 full moons in a year. This gives 11 months with one full moon each and one with two. This second in a month, so I interpret it, was called Blue Moon." Turns out this is not what Lafleur meant at all and the mix up was due to which "year" Lafleur was referring to — and it wasn't the calendar year, but the tropical or seasonal year which is measured from one winter solstice to the next. Problem was Lafleur did not identify this detail and Pruett assumed wrong. Pruett's article, published in a popular scientific magazine with a large circulation, was from then on cited enough over the following years that this mistaken definition became the accepted one. Astrology is concerned with natural cycles and the cosmological, rather than man-made, measurement of time. Astrological time is metered out in the perpetual motion of the cosmos, and the natural cycles of the seasons here on earth which are reflected in the 12 tropical zodiac signs. Therefore an astrological Blue Moon would be more meaningfully defined as a second consecutive new or full moon that falls in the same astrological sign, not necessarily falling in the same calendar month. These back-to-back, same-sign "lunations" increase the influence of a single zodiac archetype, its special qualities are magnified and intensified, doubly emphasized in our lives. These are the "Blue Moons" relevant to astrologers. For example, a new moon in early Libra will fall before a full moon in its polar opposite sign of Aries; but a later degree Libra new moon falls after the Aries full moon and before the full moon in Taurus, the sign quincunx to Libra, or "one off" opposition. The significance is the fact that this "inconjunct" full moon is the culmination of the Libra lunar cycle, rather than a full moon in its oppositional pair, Aries. An inconjunct aspect indicates the need for conscious adjustment in order to integrate two energies that do not share common assets: the element (fire, earth, air, water) is not the same, nor the mode (cardinal, fixed, mutable), nor polarity (positive/negative). So a Blue Moon greatly changes the "progression energetics" from new to full moon each month. Until the next Blue Moon comes around and the pattern shifts once more back to "normal." The new moon falls in one sign, with a subsequent full moon falling neatly in its oppositional pair. When I was in college, my astronomy professor performed a very simple, nifty little demonstration to show how light is scattered by particles, which in turn — this bending of the waves of light — affects how we perceive color. Placing a beaker filled with a solution of water and powdered milk on the overhead projector, he flipped on the light and the pale white solution in the beaker immediately glowed a luminous, sky blue. At the same time, projected on the overhead screen, appeared a perfect circle of yellow-orange — a crowd-pleasing demonstration that showed how particles scatter light, which in turn results in how and why we see color. On August 27, 1883 the most powerful volcanic eruption in recorded history took place on the Krakatoa Islands. Located between Java and Sumatra, the islands themselves owed their existence to a massive eruption early in the 5th century AD. In the wake of the 1883 eruption over 36,000 lay dead and the entire island detonated with a force unknown in the pre-atomic age. Krakatoa, which stood some 6000 feet above sea level on August 26th, had simply ceased to exist twenty-four hours later. Some three-quarters of the island had been blasted away or sank beneath the ocean into the crater where the volcano once stood. The eruption bundled together a catalogue of individual disasters: massive explosions, earthquakes, toxic clouds of superheated ash and gasses, and a tsunami whose 140 foot waves decimated 165 villages in the region. A ship in a nearby bay was lifted by the ensuing tidal wave and deposited two miles inland. A volcanic hail of stones rained from the sky while shrouds of ash turned the daytime sky pitch black. Four enormous explosions took place on August 27, 1883, so strong they were heard 3,500 km away in Perth, Western Australia and on the Indian Ocean island of Rodrigues, 4,800 km away. Each explosive eruption was accompanied by very large tsunamis, which are believed to have been over 30 meters high in places. Krakatoa's eruption propelled tons of ash into the sky and generated climactic changes as particles blocked sunlight and reduced temperatures. Created and then destroyed by the very same geological forces, the blasted remnant of the island stood for half a century as proof of the volcano's power and fury. That is until 1927, when a new volcanic peak began to rise out of the ocean where part of the island had once been, which now stands 2600 feet above sea level! Its name: Anak Krakatoa, the "child of Krakatoa." A few years ago, this child's "tantrums" displaced tens of thousands of residents in nearby South Lampang district, when explosions and eruptions necessitated evacuation. Thirteen is a number strongly associated with Venus through the golden mean, that divinely perfect, mathematical ratio of 1.618. Aristotle, Plato and Pythagoras all considered it sacred, the divine proportion. The number 13 is associated with Venus, the golden mean — and the Blue Moon.It is found in objects that we perceive as beautiful and pleasing to the senses, such as a handsome face. Even that old hardback edition of Winnie-the-Pooh employs this pleasant length-to-width ratio. The cycles of Venus herself, the planet we most associate with beauty, proportion, and harmony, reflect the golden mean and the number 13. Venus polishes off five complete cycles (584 day intervals) in a total of eight years and five days. Eight divided by five happens to equal 1.6, our golden mean, and of course 8 plus 5 equals 13. Moreover, 5, 8 and 13 are in the "magical" Fibonacci sequence: 0, 1, 1, 2, 3, 5, 8, 13, 21, 34, 55 and so on. The sequence is derived by a simple formula: each number is the sum of the previous two. 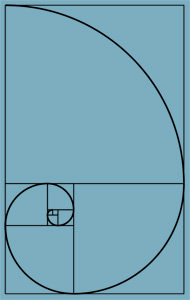 The ratio between each Fibonacci number is this same golden mean. This divine ratio is found all over nature from the patterns of growth spirals we see in pinecones, sunflower seed heads and spiraling mollusk shells to galaxies spinning in space. Medieval and Renaissance design and construction of sacred buildings commonly applied the golden ratio. Here is an interesting article by a builder who noted the golden ratios, including the pentagram, evident in the design of his nearby parish church. The ratios in a pentagram, the five pointed star, include the golden mean. An ancient symbol of wholeness and protection, the pentagram is associated with Venus, present in her 584-day cycle. Inscribed on the zodiac wheel by marking the degrees of critical stages in Venus's movements in concert with the Sun, every time Venus completes five of her cycles, a new pentagram is drawn. The other interesting connection between Venus and the pentagram is the fact that when you slice an apple in cross-section, you see tucked away in the core an interesting five-point seed pattern in the shape of a pentacle, shown here. The apple, whose botanical name is interestingly malus, is a plant ruled by Venus and an old fertility symbol, reflecting in the old pagan custom for brides to wear apple blossoms in their hair. So 13 is associated with Venus, the golden mean, the principles of beauty, symmetry, and heavenly proportions — and the Blue Moon. The number's association with witchcraft arose from attempts to turn older, nature-based wisdom systems into evil things. The witch, with whom this number, the pentacle and the apple are all associated, is really the crone of course. The young, fertile goddess in her sage aspect, which is itself a symbol for the astrological combination of Venus and Saturn, through Saturn's associations with old age and wisdom. Even the witch's most common familiar, the cat, relates back to Venus in her Norse guise of Freyja, the Germanic Venus, for whom Friday is named. 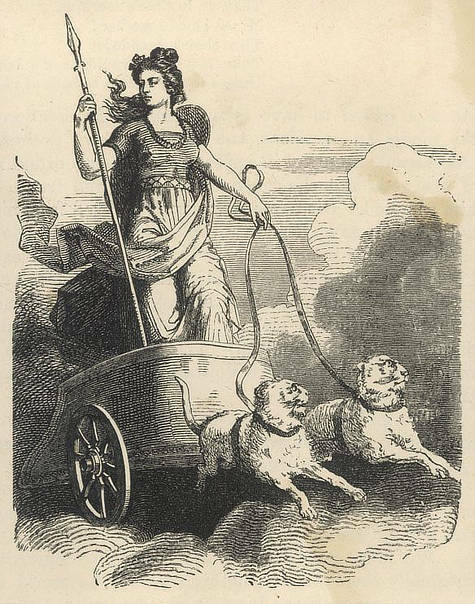 The Queen of the Valkyries and Goddess of Love, Beauty and War, Freyja flies through the heavens in a chariot drawn by two cats, but was also sometimes depicted flying on a broom. Blue Moon Astrology is free of ads and free to all. If you enjoy reading this blog, a Gratitude Donation would be very much appreciated! Thank you! If you'd like notification when I post new articles: subscribe to my mailing list. 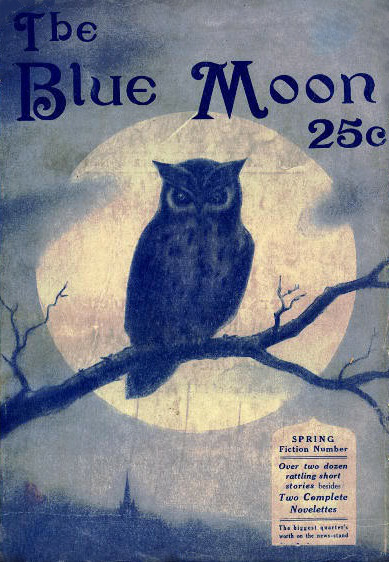 The Blue Moon magazine cover, above with the owl, I found in an online search. I'm not sure of the date, but obviously a while ago, when a fiction quarterly sold for 25 cents. The cover of Sky & Telescope's January 1948 issue, shown above, features a photo of the convoy delivering the "200-inch Big Eye," the lens for the brand new Palomar observatory's telescope. Ironically, weather conditions afforded zero visibility as they attempted to move the giant lens to its permanent home in the big dome. Writing in this same January 1948 issue, Nancy R. Bolton, staff writer for Sky & Telescope magazine, shared the following: "the way up the mountain road to Palomar a fine drizzle of rain was falling, at points a mixture of snow and rain. It was impossible to see beyond a few feet. George H. Hall, of the Caltech publicity department, who was driving our car, had to keep his head outside the car a good part of the time even to drive at a snail's pace." Cover art and information are from this informative blog, Palomar Skies. Here's an interesting account of the Krakatoa explosion published in The Atlantic Monthly, September 1884 issue. 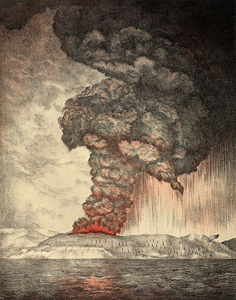 The lithograph of the 1883 Krakatoa eruption is dated 1888 and posted here courtesy of Wikimedia Commons. Here's more information with maps and recent photographs of the region, Krakatoa and Anak Krakatoa. Information about Venus's synodic cycles and the related number 13, the rose and pentagram were drawn from Pietre-Stones informative site on Freemasonry and its associated symbols. Information about the Fibonacci sequence and related golden mean mathematics was drawn from this interesting Wiki article.